“Run Forrest, Run!” Probably one of the most famous phrases in movie history, but how did Forrest run across the whole country without suffering a knee injury? Patellofemoral pain syndrome is referred to as ‘runner’s knee’, but it can affect anybody. The condition is more common in athletes, but also affects office employees and anyone who sits for prolonged periods. A generic term for pain at the front of the knee, in most cases of patellofemoral pain syndrome there’s no actual damage to the knee joint. Surgery is rarely needed, with common treatments involving physiotherapy or the use of a knee brace. When combined with other knee rehabilitation treatments, a knee support brace will play a key part in relieving patellofemoral pain. If you suffer from a nagging pain at the front of the knee, don’t worry we’ve got you covered as we look at options for the best brace for patellofemoral pain syndrome. Knitted cotton fabric knee brace with patella supportive doughnut-shaped pad to eliminate pressure and deliver intermittent massage. Six sizes for either right or left leg fit. Medical-grade compression to relieve knee pain and swelling. Class 1 medical device hinged brace made from premium-grade neoprene. Reinforced open-patella design to support patellar tracking problems. One size with fully adjustable compression for best fit. Neoprene and Velcro knee brace with an open-patella design. Adjustable straps allow for custom size and compression where you need it. Lightweight, breathable and flexible—won’t restrict your movement. Comfortable patella support brace for mild to moderate patellar dislocations. Plastic hinges provide medial/lateral support and provide a consistent pull to realign the patella. Made from Breath-O-Prene; an antimicrobial wicking fabric that’s lightweight breathable and hypoallergenic. 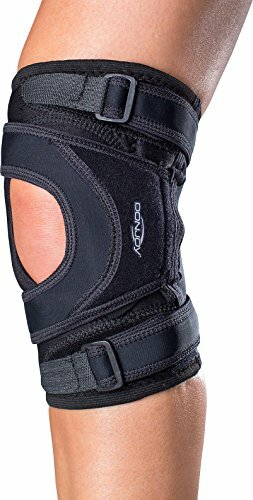 Wraparound knee brace for improved knee stability and support. Reinforced open-patella design to support the kneecap and reduce the pressure and stress of movement. Breathable and lightweight neoprene latex free available in one universal size up to 17.5 inches knee circumference. Patellofemoral syndrome is the condition that describes pain in the front of your knee and around the kneecap, known as the patella. When the patella has improper tracking in the femoral groove, it’ll cause a sharp pain or a dull ache around or underneath the kneecap. This often gets worse with movement around the knee area when going about daily activities or bending the knee while weight bearing. Although it affects millions of us, patellofemoral pain syndrome is more frequent in athletic individuals like runners, hikers or cyclists. A survey found that 25 percent of all knee injuries seen in a sports medicine clinic were related to patellofemoral pain. Overuse of the knee joint and trauma like falling on your kneecaps are common causes. Poor tracking of your patella in the groove at the end of your femur has been linked with patellofemoral pain syndrome too. When you bend your knee, sometimes the kneecap will be pushed out to one side caused by muscular imbalances or weaknesses. While symptoms of patellofemoral syndrome can be extremely painful, the condition can usually be treated in your own home. Once diagnosed, a doctor will recommend the best course of action for treating your patellofemoral pain. This can include orthotics which take the stress off your lower leg by stabilizing your foot and ankle. Non-steroidal anti-inflammatory drugs which reduce the swelling and relieve the pain are another option. Over-the-counter drugs like ibuprofen and acetaminophen will help with healing too. Always consult your doctor before taking any new medications. Gentle exercise and stretches will improve your strength and mobility without risking further damage to the knee. By strengthening the muscles attached to your knee, you’ll reduce the patellofemoral pain. In the following YouTube video, a physiotherapist details some exercises and stretches that’ll get your patella back on track. As patellofemoral pain syndrome is often caused by overuse or overactivity, resting the affected area can help treat the condition. The RICE method (rest, ice, compression and elevation) will relieve the pain and help reduce any swelling. Taping or a bandage may be used for compression but the effects will decrease over time. The best brace for patellofemoral pain will apply an external force that counteracts improper patella tracking. Studies have shown that patellar braces significantly alter the patellar tracking. One study found using a knee brace alters the position of the patella in the femoral groove of patients with patellofemoral pain syndrome. Basically it puts your knee back in the groove. A knee support brace will stop the patella from deviating too far laterally, but the patella can move in other planes too. Using a knee brace with therapeutic exercises will help ease that pain more effectively. With so many types of knee supports available, it can be difficult to know which is the best brace for patellofemoral pain syndrome. It’s important to choose the correct brace to address your type of knee pain. Patellar tendinitis is a similar condition but presents itself on the front of your shin bone and treatment normally requires a patella strap. This creates a false insertion point on your tendons which takes pressure from the sore and inflamed area of pain. Knee braces for patellofemoral pain are usually a sleeve-style of brace that’ll control or restrict the movement of your knee cap. An open patella-design will reduce the stress caused by movement on the kneecap, with many braces featuring a reinforced patella opening. This can take the form of a gel pad or buttress which assists with the medial tracking of the patella and relieve the pressure or stress on your kneecap. We’ve looked at many of the top-selling braces to bring you, in our opinion, the best five options for the best brace for patellofemoral pain syndrome. The GenuTrain P3 knee brace has been designed to relieve pain from the misalignment of the knee cap with P3 standing for permanent patella protection. Using a corrective strap, an integrated ring-shaped pad holds the kneecap securely and prevents drifting. This knitted brace/sleeve can be used to treat and prevent patellofemoral pain syndrome, chondromalacia, dislocation of the knee or other patella-related problems. 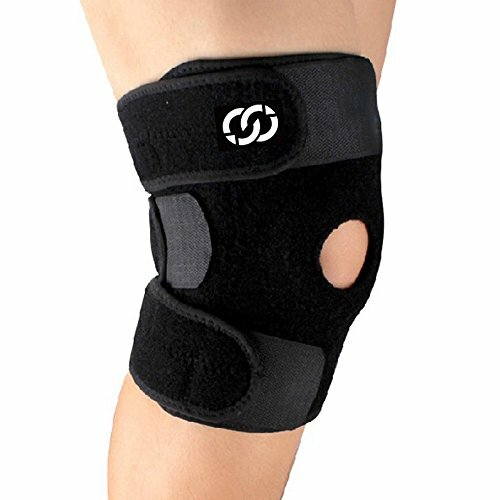 What we particularly like about this knee brace is the knitted cotton fabric is both breathable and moisture wicking yet offers a medical-grade compression. Along with a wide range of sizing options that go beyond small, medium or large, this sleeve offers an all-day comfortable fit that won’t slip or bunch up. An incorporated viscoelastic Omega pad surrounds your kneecap to relieve pain and provide a massaging pressure. Knitted cotton fabric is more skin friendly than neoprene. Six sizes available for a custom fit. Stabilizes knee cap without limiting movement with two supportive pads. Massaging effect for pain relief. Only fits one leg with sizes available for right or left. If you have larger thighs it can be too tight. Too restrictive for running and may shorten your stride. If you’re looking for some high-grade support and stabilization, this brace has you covered. Registered internationally as a class 1 medical device with regulatory bodies including the FDA, this brace is manufactured to the highest quality and compliant standards. A side-hinge system and premium-grade neoprene use a non-slip design for the ultimate comfort and support, suitable for everyday activities and sports. A reinforced patellar gap aids with patellar tracking while a two-point geared hinge system helps control flexion and extension movements of connected muscles. A variable compression system (VCS) uses three straps to ensure blood flow safety while providing maximum joint protection and stability. One size fits all, is suitable for use by both men and women and is comfortable to wear with the heat therapeutic neoprene fabric. High-quality class 1 medical device. Lightweight neoprene provides therapeutic heat for sore joints. Helps with stabilization and patellar tracking. Adjustable and can be worn on either left or right leg. Neoprene may cause the leg to get too hot when worn for longer periods. People with larger legs may struggle to fit the brace. Bulkier than many similar braces. Stitching and Velcro can wear away with prolonged use. An ultra-lightweight breathable and flexible neoprene fabric means you can enjoy full movement of your lower leg with this sleeve. 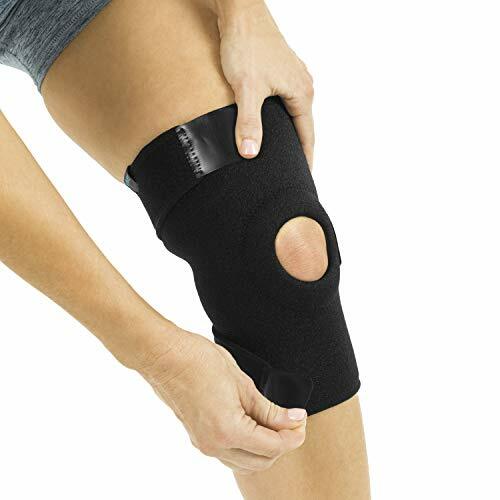 This comfortable and cozy fitting solution will effectively support your kneecap and relieve it from joint pains. The neoprene is breathable so your leg won’t get too hot and quality Velcro fastenings ensure a secure fit with an additional silicone anti-slip strip to prevent it from sliding. Three adjustable straps allow you to adjust the tension where you need it with this one-size-fits-all patella brace—recommended for thigh circumferences from 12 to 18 inches. An open-patella design relieves pressure on the kneecap and stabilizes it, with a steel spring side providing more lateral support. This flexible neoprene brace offers you excellent movement, substantial comfort and extra support. Compressions even offers a 100 percent one-year money-back guarantee if you aren’t completely satisfied. Velcro and neoprene fabrics offer lightweight yet supportive comfort. Can be used on either leg. Won’t restrict movement and any activities. One-size-fits-all won’t cater for larger knee caps or thighs. Knee spot is too small for many knees. Unpleasant odor when first purchased. Some people’s skin may be sensitive to neoprene. Not comfortable enough for all-day use. This comfortable patella support brace features removable plastic hinges, a gel pad around the patella and adjustable Velcro straps. 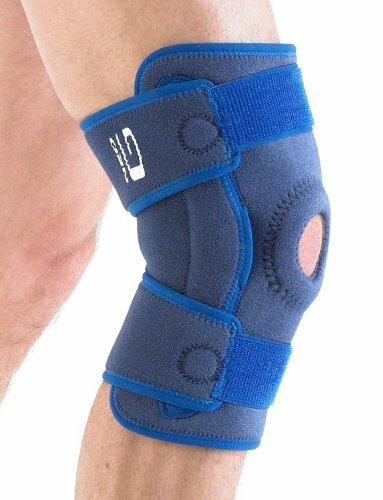 Combined with a supportive structure made from Breath-O-Prene, this brace helps alleviate patella pain and aligns your kneecap during movements. Side hinges provide additional medial/lateral support and provide a constant pull on the kneecap during flexion and extension to realign the patella. The high quality Breath-O-Prene provides a comfortable fit with adjustable Velcro straps so you can keep wearing the brace all day without fear of it slipping. The fabric is also antimicrobial, moisture wicking, hypoallergenic, lightweight and breathable. The brace only provides light support, but is ideal for those suffering from patellofemoral pain syndrome or other symptoms of injured patellas. Removable plastic hinges pull at knee cap to realign patella during movement. Lightweight Breath-O-Prene material is less likely to irritate the skin. Velcro straps for an easy and secure fit. Wide choice of seven sizes for thighs from 13 to 32 inches in circumference. Designed to be tight but some users may find it uncomfortably tight. Separate braces needed for left leg or right leg design. Velcro straps are too thin and may cut into your leg. This budget-priced all-purpose knee brace from Vive can help with knee stability and support, preventing or treating the symptoms of patellofemoral pain syndrome. A reinforced open-patella design supports your kneecap and reduces the pressure and stress created by movement. Proper alignment of the ACL and MCL helps to relieve strains, sprains and improves patellar tracking while allowing for a full range of motion. Secured with three strong hook-and-loop straps, the knee brace fits most knees up to 17.5 inches in circumference. You can also tighten or loosen the straps to achieve the optimal level of compression and support needed for pain relief. A durable Neoprene fabric is used which is naturally moisture wicking and breathable to keep you cool and dry. Strong Velcro fasteners for adjustable compression and support. Also good for injured muscles and recovery after surgery. Open-patella design reduces pressure on kneecap. Latex-free breathable and lightweight neoprene. Sizing runs small and can be too tight for those with larger legs. Can be awkward to make secure with three-strap system. Design can bunch up behind the knee and cause chaffing of the skin. 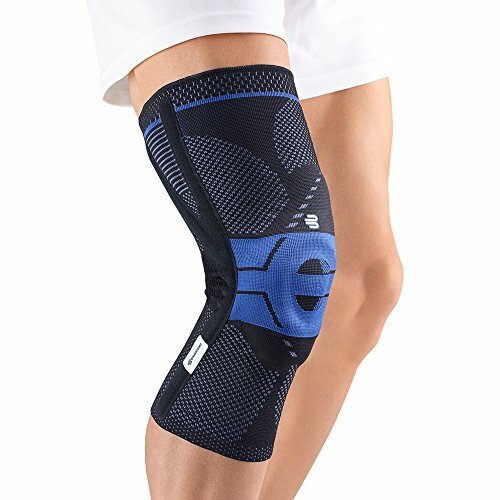 Material doesn’t flex as well as similar but more expensive knee support braces. When choosing a brace to relieve the pain at the front of your knee, it’s most important to choose one which fits securely and offers constant support to the patella. The wide range of six different sizes which go above and beyond the normal universal sizing of similar knee braces, in our opinion, makes the Bauerfeind GenuTrain P3 knee support the best brace for patellofemoral pain syndrome. Although the price may be higher than many other braces, you’re getting a great-quality knee support that’s been specifically designed for your condition. A soft cotton knitted fabric provides breathable compression and gives anatomic support wherever actually needed with an integrated gel-ring pad to hold the kneecap securely in place. Using this knee support brace will soon get you pounding those tracks again, just with less pain next time.